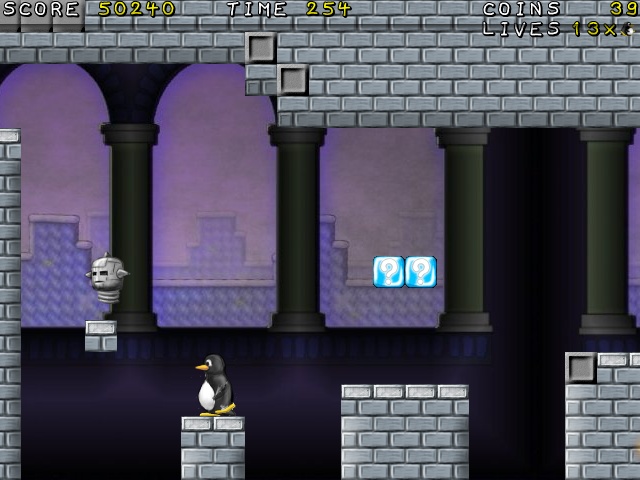 Blowing up Bits » SuperTux: The most super penguin! SuperTux: The most super penguin! May 14, 2014 | Posted in Arcade, Platform, Side scrolling | Comments Off on SuperTux: The most super penguin! 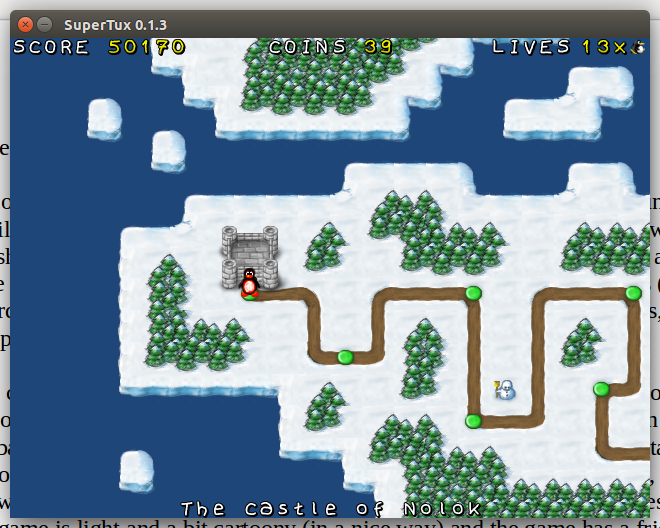 According to the SuperTux website, “SuperTux is a classic 2D jump ‘n run sidescroller game in a style similar to the original Super Mario games.” This would be true if Mario was a penguin and all of the Mushroom Kingdom were covered in ice and snow. In SuperTux we play as a penguin out to save his wife from an evil creature who always seems to be one step ahead of us (and usually hiding in a guarded castle). As Tux, we run through 2-D levels, collecting power-ups, stomping on enemies and jumping over bottomless pits. The controls for SuperTux are quite simple. We have a jump botton, buttons to make us run left/right, a button to make us crouch and one to run. The run button, I found out, can also be used to throw fireballs once we find the proper power-up. Most of the levels are short, taking around a minute or two to complete. As we run through the levels we encounter various enemies, including walking (or flying) snowballs, wandering icecubes, bombs and jumping machines with spikes on them. The atmosphere of the game is light and a bit cartoony (in a nice way) and the game has a friendly feel to it. The game is divided into a series of maps. Apart from the main (official) map featuring 26 levels, there are a number of extra maps, most of which are of a higher degree of difficulty. The main game of 26 levels starts out very simply and slowly increases difficulty as we proceed. The learning curve is gentle and the levels are typically quick-paced and fun. There are several things I enjoyed about SuperTux. One is that the game takes a simple (and familiar) concept and creates a polished game from it. Most of us are familiar with Super Mario and this game contains those same elements (jumping on enemies, growth and fireball power-ups, collecting coins and jumping over pits). The controls are smooth, the graphics are elegant and, dare I say, pretty. The level designs are a combination of unique challenges and homages to classic platform games. The add-on levels after the main game are especially challenging, often in surprising ways. The learning curve throughout SuperTux is smooth, letting us easily keep up with the increasing difficulty of the level designs. I also like that several levels have multiple pathways through them, usually an easy path with few challenges or rewards and another path with more enemies and bonuses. SuperTux does more than mimic classic platform games, it polishes the design, improves the basic graphics and generally keeps the tone light. The enemies often have googly eyes and the levels are brightly lit. This game is pure, innocent fun and I greatly enjoyed it for its modern take on the classic platforming concept.